Senecio peregrinus or 'String of Dolphin' succulent from Branette Farms received a lot of buzz at the 2019 TPIE Show. Cool Product Award winners, other noteworthy plants we found and more highlights from the 2019 Tropical Plant International Expo. As many growers and garden center retailers can attest, houseplants and tropicals are having a moment, and that excitement was apparent at the 2019 Tropical Plant International Expo. TPIE, which featured 400 exhibitors and 6,488 attendees, took place Jan. 16 - Jan. 18 at the Broward County Convention Center in Fort Lauderdale, Fla.
Theresa Riley, owner of Rockledge Gardens in Rockledge, Fla., served on the TPIE committee for several years, and said the 2019 show was a standout. "I really think this year is one of the best I remember in a very long time! Lots of positive vibes and buzz," she says. The Garden Center Group echoed this sentiment, noting that 2019 TPIE was one of the best-attended by independent garden centers that comprise the group. "We had the largest number ever of Group Centers in attendance at TPIE this year. And, as a result, we had a record number helping to find great products to present the Cool Product Awards," Danny Summers, managing director of the Garden Center Group, noted in a press release. "We have over 30 judges (a new record), and they nominated over 70 products in their search results. And, we awarded 15 companies awards for their 'cool products.'" Senecio peregrinus is actually a hybrid between Senecio rowleyanus (string of pearls succulents) and Senecio articulatus (the hot dog cactus). Its nickname was inspired by the fact that its little leaves look like dolphins leaping out from the water. Clusters of 2-inch white flowers that are held on long slender tubes release their heady perfume at night, but a curious nose may find fragrance almost any time of day. George Butler III says the difficult-to-describe fragrance is like a "spicy gardenia." Two companies pointed to this plant as one of their favorites that also received attention from attendees at the show. The plant pictured below is from Butler's Foliage. Strophanthus preussii, produces a wild and unusual floral display that arrives from late spring to fall on this shrubby climbing vine. Clusters of cream-colored flowers bedecked with long, curly streamers and a rust-tinted throat. Introducing another "character" in J. Berry Nursery's Hollywood Hibiscus Series, this ultra bright gold-orange ruffled petals leads to a deep burgundy center. A constant bloomer with full body of deep green foliage. This new bicolor cyclamen is available in four color combinations: Magenta, Bright Purple, Rose, and Salmon. Each unique gift package contains a tree, along with its own set of care instructions, personalized gift card and engraved ornament. Available with magnolia and olive varieties. Attendees crowded around this plant exhibited by Bullis Bromeliads at TPIE 2019. Sun Parasol Garden Crimson paired well with Kawaii White Peppermint in a planter at the Suntory booth. Suntory also pomoted its new compact, mite-resistant Mandevilla, Sun Parasol Mitebuster Red. This year they added even more styles and colors to this ultra light weight cover line. Available sizes: 4 inch, 4.5 inch, 6 inch and 6.5 inch. This cleverly-designed plant stand is three panels wide, hinged. Each panel features 6 planter slots (18 total). Slots include a waterproof liner. This special double plus variegated bloom on this drought-tolerant succulent is available bare-root. This new kit is ideal for Christmas gifts for hostesses, teachers, parents and more. This product is grab-and-go for the consumer, arriving to the retailer as a complete package from decorative ornaments and lights, down to the gift tag and bow. Alternate combination is available for Easter as well. Every year The Garden Center Group expects Gail Cash to reveal new creatives in her planted combinations. This year she offers a new terrariums with battery powered LED lighting. A host of new plant-container combinations were revealed with a JOY theme. Their message said, "We deliver JOY, by fusing nature, fashion, and art through unique living design." Our favorites were these planters with messages of love, as part of their 2019 collection. Designed by Don Murray and Shibu Varughese, this fun new alternative to the hanging basket. Available in two bright colors, the kit has bird body, beak, and tail feathers plus hanging chain. The combination of bright fun look and sturdy design was a real hit with the retail judges. This year they have added even more combinations in Kokodama hanging planters and created two sizes of hanging displays for the retailer making this an easy YES to add to your tropicals department. A variety of plant types are available along with several sizes of Kokodama planters. The introduction of Quicups offers retailers creative options for brightening up small plant containers in multiple of materials. All feature a plastic liner. Styles are available with or without the raised rear tab allowing for both upright and cascading plant types. Custom printing of patterns is also available. These patterns are some of the most popular in the daVinci line and speak to trends that trend analyst Christine Boland outlined in her opening keynote at TPIE. Stay tuned for more coverage of TPIE. The 2020 show is scheduled for Jan. 22-24, 2020. Christine Boland delivers her third keynote in five years at TPIE 2019 Jan. 16 at the Broward County Convention Center in Fort Lauderdale, Fla. Trend analyst Christine Boland revealed four consumer drivers that are influencing design, customers' purchasing decisions and more. In order to comprehend and align with the latest trends, it’s essential to understand what drives consumers and what's important to them, Christine Boland, trend analyst, told an audience on the opening day of the Tropical Plant International Expo (TPIE) on Jan. 16. The choices consumers and designers make are a direct result of what’s happening in the world around them, so Boland kicked off her keynote – the third she’s delivered at the Fort Lauderdale, Fla.-based tropical plant trade show in five years – by first talking about news and politics. Though we have more ways to connect technologically, the world is becoming more divided by political affiliation, as people segment themselves into their own “tribes,” or surrounding themselves with others who agree with their viewpoints. Boland cited the ongoing Brexit debates as just one example. Climate change is another topic at the forefront, but young people are taking responsibility, she says, and are eager to do their part to contribute to environmental sustainability. “Design is the voice of the sign of the times,” Boland says. There is “lots of bad news out there, but good news, too, especially when people take matters into their own hands.” Individuals are making a difference, and brands have the opportunity to lead the way, as well. With that foundation, Boland outlined four consumer drivers that she says are behind trends – and influencing purchases – today. Boland urged attendees to “Make generosity part of your growth strategy” and cultivate compassion for common ground and inclusivity. Understanding what’s important to your customers is key, she said. For example, accepting all people for who they are, no matter their ethnicity, gender or age, is one driver for consumers today, and they want this to be reflected in the brands they choose to support. Companies such as Airbnb are not just incorporating diversity in their advertisements, but emphasizing that all are welcome – no matter where you are from or who you worship or love – with its #weaccept campaign and promise to help provide housing for those in need. Barbie, the brand behind the iconic but often criticized doll for promoting unattainable beauty standards and focusing solely on outward appearance, recently launched its #MoreRoleModels campaign, highlighting women such as artist Frida Kahlo, filmmaker Patty Jenkins and snowboarding champion Chloe Kim by creating dolls in their likeness. Taking this a step further, it’s important that brands “don’t just make people aware, but give them a way to help,” Boland says. Many have followed in TOMS footsteps – no pun intended – by incoporating one-for-one models in their companies – you purchase one pair of shoes, another pair is donated to someone in need. For 2 weeks in 2016, IKEA invited customers of its flagship store in Norway into a display room modeled after a damaged home in Syria, with details about the conditions there on signs and price tags, but also ways they could donate to help people in crisis there. This is perhaps one of the most exciting and meaningful trends for the horticulture industry. Boland noted that consumers are increasingly wanting to reduce and reuse waste and be part of a solution to sustain the planet. One example is how people are reclaiming what could be considered trash – such as corn leaves – and using them to create beautiful, artful patterns in design. Beyond design, especially as we develop more sophisticated technology and feel constantly connected, people are escaping into nature. According to the National Park Service, in 2017, the number of visits to parks across the U.S. broke the previous 2016 record, with more than 330 million visits, and 16 percent of reporting parks set new visitation records. 2018 numbers are not yet available, but it is estimated that they will once again set new records. People want to create this “escape” in their own homes and backyards, too. Houseplants are performing well for garden centers across the country, and according to our 2018 State of the Industry Report, they are now ranked third of the top five best-selling plants, along with annuals, perennials, edibles and trees and shrubs. Outside gardens are being planted with purpose, too. The Million Pollinator Garden Challenge is poised to meet its goal this year, with an announcement expected in February. 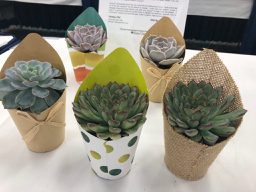 A love for plants can be seen in clothing and décor design as well, with floral and foliage patterns being spotted on clothing and pottery, and not just on the TPIE show floor. Defining who you are as a company is key to break through the clutter, and keeping it as simple as possible is important, Boland says. Garden centers and their partners can “be a guide,” providing resources and support for people who want to grow plants indoors and out. Boland says one way to think about this is to, “Be a beacon and act like an octopus.” Create a foundation for who you are as a brand, but always consider how you can reach consumers and better understand them and what they want. Answers to most questions are just a Google search or Siri voice request away, which is great, but this also eliminates opportunities for magic and play. What happens to surprise when everything is planned for us or answered by AI (artificial intelligence) and other technology? Boland asked. How can you incorporate play into your business? One example of this in design trends is that irregular patterns and shapes are being used more, Boland said. Look for more coverage from TPIE on our website and in Garden Center magazine soon. Danziger will soon be Terra Nova's dedicated licensee and producer of vegetative cuttings for Europe, Asia and Africa. Terra Nova Nurseries and Danziger jointly announced this week at IPM Essen the two companies are entering into a new alliance, whereas Danziger will become a dedicated licensee and producer of vegetative cuttings from Terra Nova Nurseries’ stock in Europe, Asia and Africa. Danziger will produce the Unrooted Cuttings (URCs) to fulfill orders in Europe, Asia and Africa. "We believe that this collaboration and the addition of world class perennials genetics by Terra Nova will enable us to provide our customers with a complete assortment and will benefit all parts of the horticulture value chain" says Amir Dor, director of sales for annuals & perennials at Danziger. “We find this strategic collaboration as a growth opportunity for everyone involved,” says Ken Brown, managing owner of Terra Nova Nurseries. “We all see the importance of providing the best availability of high-quality vegetative cuttings in all markets. We believe Danziger is one of the best producers, coupled with excellent market reach and customer service, we consider this partnership as an important key in developing our international sales." This new partnership will be launched at IPM ESSEN 2019 and customers can expect availability of cuttings as of week 40 in 2019. Availabilities will be visible through Danziger’s ordering system. The Garden Center Executive Summit features sessions on hiring, company culture, marketing, lean management and more presented by knowledgeable industry leaders and outside experts. Excitement is building for the inaugural Garden Center Executive Summit, the educational conference for key-decision makers of independent garden centers, which will kick off Feb. 18 in Denver, Colo.
“The Garden Center Executive Summit is for the leaders who want to navigate their business, and our industry, into tomorrow’s uncharted waters,” says Rob Sproule, co-owner of Salisbury Greenhouse, No. 56 on Garden Center magazine’s 2018 Top 100 list. Sproule is one of seven conference board members who helped shape the educational program for the summit and will be speaking at the event, which features sessions and panels from independent garden center leaders who will share ideas for best business practices and how they have managed industry-wide challenges like hiring, marketing, ecommerce and more. View the schedule, speaker and registration pages for more information. The Garden Center Executive Summit will also provide an opportunity for garden centers to gather and network at several events during the conference, including an awards celebration for the 2018 Top 100 Independent Garden Centers that will take place Tuesday, Feb. 19. “The discussion and speaker topics for this event are exactly the subjects that owners and upper management in our industry need to stay up-to-date and relevant,” says Richard Christakes, CEO of Alsip Home & Nursery, No. 16 on Garden Center magazine’s Top 100 list, who will speak about his experience with online retailing at the event. Chris Taylor, CEO of Fisher’s Technology in Boise, Idaho will provide actionable ideas for hiring for success and building a strong, healthy company culture in his keynote on Monday, Feb. 18. Taylor will explain what he has done during the past decade-plus to attract and hire driven people, build and maintain a culture that focuses on staff longevity and success and how Fisher’s developed and executed a strategy to continue to support its employees. Mark Graban, an expert in lean management strategies, will explain how garden center owners can incorporate lean business practices to improve customer experience, employee efficiencies and more during his keynote on Feb. 19. The conference registration includes two evening networking receptions, breakfast and a lunch gathering. “[The Garden Center Executive Summit] is such a welcome opportunity to stop, to free ourselves of our daily routines, and to get to know other people as passionate as we are about making our community more beautiful,” says Mick Mulhall, president of Mulhall’s and conference advisory board member. The Garden Center Executive Summit will take place Feb. 18-20, 2019 at the Denver Hyatt, and is supported by a group of sponsors dedicated to the success of independent retailers. To learn more, visit our website www.gardencentersummit.com. The resource provides education requirements, salary expectations and related links and videos for nearly 100 careers working with plants. Seed Your Future has launched its new free online horticulture career exploration resource. Much more than a basic alphabetical list of the almost 100 careers in the horticulture industry, the tool first asks site visitors to consider what they are interested in, and then lists careers in horticulture that might match their interests. Each listed career links to a unique page that contains key information to help the user learn about that career. Every career page includes information about the job, the level of education required, links to where to study in the U.S., data about salaries, links to professional organizations supporting that career, and engaging videos of people in those careers. Meant to provide introductory information to each career across the art, science, technology and business of horticulture, the new resource will continue to grow as more careers are featured, and more videos selected to help users understand all of the diverse options in the horticulture industry. “Seed Your Future is committed to providing quality, reputable information about all of the exciting careers available across the art, science, technology and business of plants,” says Susan E. Yoder, executive director of Seed Your Future. “Showing students, parents, mid-career changers, educators, and anyone else interested in plants that there are meaningful and rewarding careers working with plants is one of the goals of Seed Your Future. Whether this resource introduces site visitors to a fulfilling career, or a lifelong passion, one thing is clear — the more we know about plants, the more we can make a difference in the world today." Research identified the lack of detailed, centrally accessible information about the careers available in horticulture. Parents, teachers, guidance counselors, and youth all expressed the need for online resources to help them find out more about the careers available working with plants. The site SeedYourFuture.org/careers serves as a digital hub for all horticulture-career information in a concise, easy to read format with links to external resources, places to study and find scholarships, and videos of real people in each of the careers fields.